Getting a pay raise while sitting on the couch? Sign me up! Thanks Cummins for the pay raise! Something I love about dividend growth investing is that each month I get to hear about companies I own deciding to pay me more money in dividends. Just for owning a small portion of said companies. Not going and doing R&D for new products or technology. Not selling any products. Not managing any employees or inventory. Not making sales calls. All I had to do was have the foresight to invest some of my savings in excellent companies. That's dividend growth investing at work! I mean who doesn't like getting a raise for doing nothing? Dividend growth investing is far from a get rick quick investment strategy, rather you need to remain focused on the long term goal to be successful. It's always great to see one of the companies you own announcing a dividend increase. 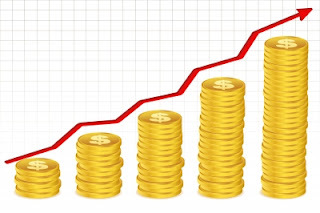 Yesterday the Board of Directors of Cummins, Inc. (CMI) gave investors another pay raise increasing the dividend from $0.975 to $1.025 per quarter. That's a solid 5.1% increase compared to the previous quarters' payment. Cummins, Inc. is a Dividend Contender with 11 consecutive years of dividend growth. Shares currently yield 3.45%. Since I own 23.318 shares of Cummin in my FI Portfolio this raise increased my forward 12-month dividends by $4.66. 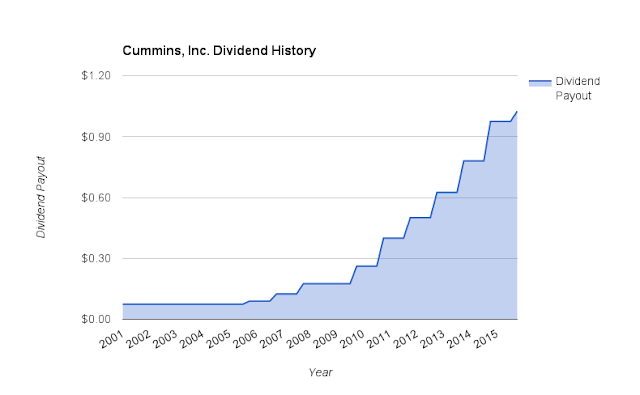 This is the 4th dividend increase I've received from Cummins since initiating a position in 2012. Cumulatively my income from Cummins has increased by 105%!!! 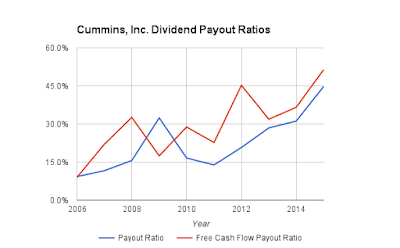 A doubling of dividend income in just 4 years is might impressive. According to USInflationCalculator the total rate of inflation over the same time period is just 4.6% so Cummins has increased my income 25 times faster than inflation. 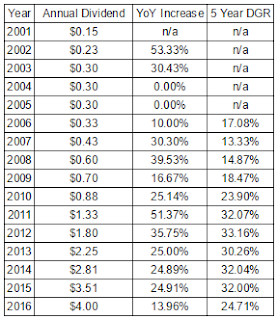 As you can see in the graph Cummins wasn't much of a dividend grower in the early 2000's keeping the dividend steady year after year. However, starting in mid 2006 things changed and the company started churning out higher dividends year after year. 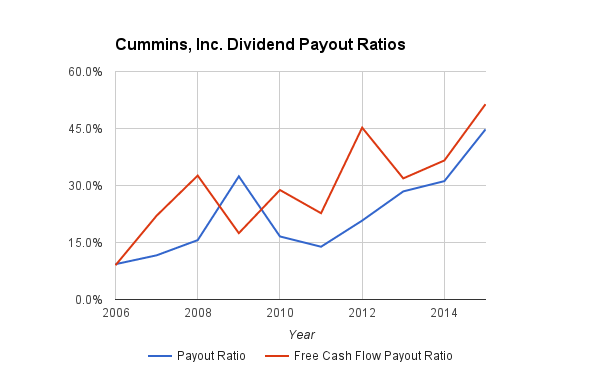 Cummins did actually put together a short streak of dividend increases from 2001-2003 although that was due to increasing the number of payouts rather than the payouts themselves. 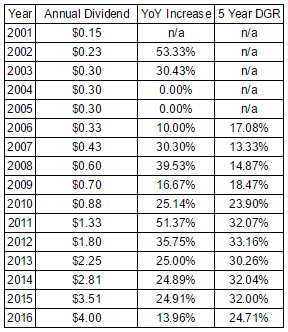 The dividend was then kept steady until 2006 when it really started to take off. The increase announced yesterday is the smallest raise since Cummins started their current streak in 2006 which means dividend growth is likely going to track earnings and free cash flow growth rather than an increasing payout ratio. My forward dividends increased by $4.66 with me doing nothing. That's right, absolutely nothing to contribute to their operations. Based on my portfolio's current yield of 2.92% this raise is like I invested an extra $160 in capital. Except that I didn't! One of the companies I own just decided to send more cash my way. For a dividend growth investor there's not much that's better than hearing news of a dividend increase. So far this year I've received 28 increases from 24 companies increasing my forward 12-month dividends by $161.32. My FI Portfolio's forward-12 month dividends increased to $5,602.25 and including my Loyal3 portfolio's forward dividends of $63.67 brings my total taxable account forward dividends to $5,665.92. Do you own shares of Cummins, Inc.? Do you think they can keep their dividend growth streak going? As a CMI shareholder, I'm happy to hear the news. I missed the announcement yesterday. Thanks for sharing. It was great to see another raise from CMI although I have to admit it was a bit disappointing given the increases that they'd been churning out. I'm not complaining though about a 5% pay raise though.